Lock in a great price for Le Parc Suite Hotel – rated 8.5 by recent guests! The location is ideal, a short walk to Melrose with its shops and cafes. I knew we'd get a comfy bed and have plenty of room because I've stayed at Le Parc before. We tried the restaurant and had a delicious breakfast there. The pool is heated so we enjoyed swimming even on chilly mornings. In my opinion, the roof is the best place for a pool! It's great to have a suite with a balcony. The gas fireplace is a nice touch. Self-park was easy and convenient. The room was really cool. I love the retro feel to it. The size, the decor, the comfort! My favorite place to stay when traveling! I travel 50% of the time all over the country and this hotel always feels like home to me. I actually don’t want to leave! This hotel far exceeded my expectations. For the price I expected a standard hotel room. Instead, I had a large suite with a fireplace, private balcony, kitchen, walk in closest, makeup vanity and more. The hotel has a full restaurant and the food was delicious. Staff was extremely helpful and polite. The location was perfect. In a busy area of West Hollywood, however right off the street in a quiet neighborhood. I was traveling for business, however this hotel would be great for a vacation. The staff was very nice and did what they could for a nice stay. The generous sized and nicely appointed rooms, the great location, the friendly staff. The beds are comfy, fire place is a great touch and the location is awesome. Awesome room - lots of space and very comfortable. Great location and close to the strip of shops and restaurants. Parking on site. Rooftop pool is great. It was a great visit the location was great and the suite was perfect, only thing was that the toilet was already clogged checking in. That was disappointing , however a staff member was sent up accordingly and assessed the situation. Le Parc Suite Hotel This rating is a reflection of how the property compares to the industry standard when it comes to price, facilities and services available. It's based on a self-evaluation by the property. Use this rating to help choose your stay! Discover an urban oasis and ultimate relaxation at this luxury boutique hotel, located in the heart of West Hollywood city center. Enjoy elegant amenities and state-of-the-art facilities, seconds from the action of the city. 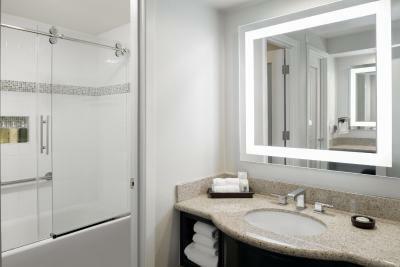 Le Parc Suite Hotel features numerous modern amenities and facilities. Guests can experience the beautiful city from the hotel's roof, equipped with tennis courts, a swimming pool and a sun deck or relax with a massage with the hotel's spa services. Guests can enjoy the on-site restaurant Knoll at Le Parc. The restaurant is a bistro that uses local ingredients and serves a variety of cuisines. Only steps from Le Parc's front doors are many of the area's most famous attractions. 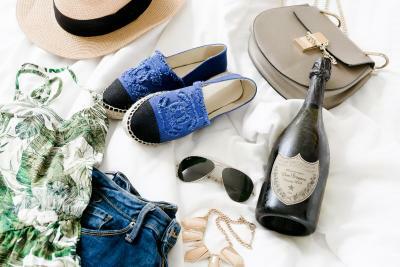 Enjoy luxury shopping on Rodeo Drive, dine at legendary restaurants, or discover the vibrant nightlife of Santa Monica Boulevard. When would you like to stay at Le Parc Suite Hotel? Featuring a separate, step-up bedding area with drapes that can be drawn for privacy, this studio features Le Parc’s amenities and an iPod docking station. A kitchenette is also provided. This very spacious 1-bedroom suite features a large living room with a fireplace, flat-screen cable TV, and iPod docking station. A kitchenette and a minibar are provided. 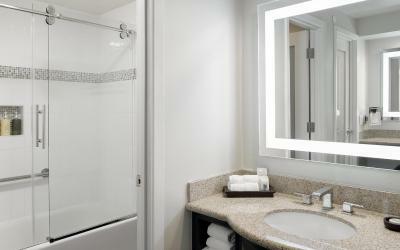 The private bathroom includes a bathtub and plush bathrobes. This spacious suite features a sitting area with a sofa bed, a cable flat-screen TV, a kitchenette, and a private balcony or patio. The bathroom has a bathtub and bathrobes. Featuring a kitchenette, this studio includes Wi-Fi and a flat-screen TV with satellite. 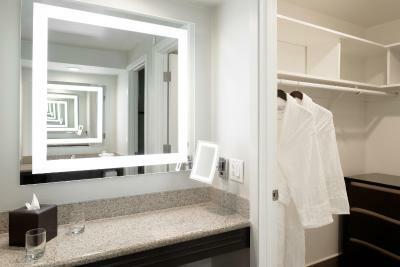 Plush bathrobes are featured in the private bathroom. A flat-screen satellite TV, fireplace, and DVD player are available in the sitting area. 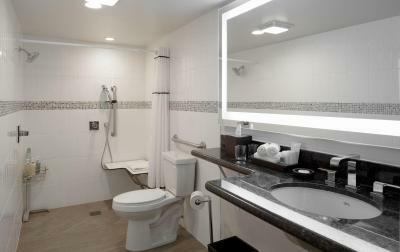 A kitchenette and a minibar are provided for guest convenience. 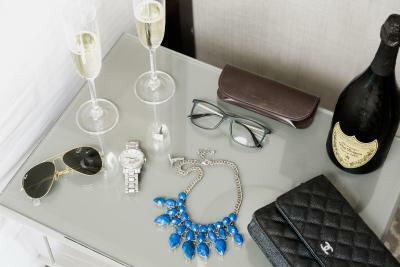 House Rules Le Parc Suite Hotel takes special requests – add in the next step! Le Parc Suite Hotel accepts these cards and reserves the right to temporarily hold an amount prior to arrival. Although overall very tidy, a little more attention to cleaning is called for. The pool opens at 7 AM but was littered from the night before at that time. The shower needs an update. Fridge could not fit much and did not cool properly. The cupboards in the kitchen had no equipment. Plates and mugs were provided once we asked. Comfortable beds and good tvs. Nice toiletries. The parking was insanely expensive and the area was dumpy. The room was large, clean and comfy. The bed was very comfortable. The staff was great. Workout room. I really love working out everyday and it is very small and limited. It would be nice to be given a bottle of water or two per day while there. That’s all! I can’t think of one other thing that is missing. Great location and very spacious room. Rooftop is great too! The staffs. The location. The room. The hotel booking system seemed to have trouble getting my reservation from Booking.com. It took them ages to solve this problem and finally checked us in. Luckily we were patient and the staff were friendly and trying their best to fix this. Another thing is for some reason the staff working at the restaurant was neither friendly nor caring about welcoming us. That's why we left for other places to eat. Thirdly the parking price should be reasonably cheaper. Location of this hotel is great, about 20 mins drive anywhere I needed to visit, Universal Studio, Hollywood etc. There were some cool restaurants and pubs down 1 street away 5 mins walk. A quiet lovely place with nice furnitures and friendly front-desk and house-keeping staff. We were 4, and the sofa bed was just like a queen bed. I really liked the bathroom structure. It looks like an old apartment building from the outside and there’s not much of a lobby as it is an apartment conversion. The rooftop pool and cabanas are great! Walking distance to everything. In room coffeemaker was dirty, hallway of floor one reaked of stale weed and the up charge for room service is atrocious!